Thursday, May 2, is a day to be especially watchful. Jihadists are particularly fond of celebrating anniversaries and on that day in 2011 Seal Team Six found and killed Osama bin Laden. September 11. 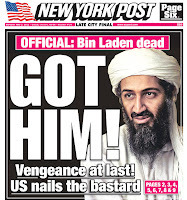 2001 is now an indelible part of U.S. history and on September 11, 2012, jihadists attacked and killed an American ambassador and three others. The threat that Islam presents to America in particular and the world in general is beginning to influence what non-Muslims think of this death cult. President Obama’s approach to Islam was initially one of outreach and accommodation. The fact that his father was a Muslim and that he had spent his youth in Indonesia as the adopted son of a Muslim no doubt influenced this and many believe he remains a Muslim despite his denials. Despite the fact that the search for bin laden began following 9/11, Obama took credit for the having found and killed him. No credit was publicly given to Bush who he had relentlessly criticized for the wars in Afghanistan and Iraq. President Obama labored through his first term to remove American troops from Iraq and has sent 2014 as the year they leave Afghanistan. Bin Laden’s call and the instructions of Mohammed are the driving force behind the efforts of Muslims in nations throughout the world to wage war and we are witnessing that effort. So long as President Obama remains in office the effort to thwart that war will be muted. His closest advisors and those in his cabinet such as Janet Napolitano, in charge of the Department of Homeland Security, will continue to tell Americans that a successful effort is being waged. It is not. On May 2 and every day for a very long time to come, Americans will be on the front lines of the war on terrorism, the war between Islam and America, the war against the world. I will check under my bed just to make sure Mohammed isn't there. Bin Laden like any Muslim monarchs dreamt of expansion but he had different attitude and vengeance in his mind. Reportedly he was a drug pedlar having contacts with Texas family.He had a mysterious death in a safehouse provided by Pakistan Army in which there are so many US moles. Find be reasons to celebrate as it was not an achievement at all. It was a very good operation no doubt, a good picture can be made like,"Operation Entebbe"
As far as general awareness of UD citizens on Islam, by and large people know it but rest of the world view it different from Economic angle. How could a problem of Golan Heights has shaped up so different in 40 years? I do visualize, all Islamic countries will get united like herd of blue bulls di at night but few equipped with WMD may react out of sheer mad fit of Islamic frustration. Pray all goes well ! Vimal, "a drug dealer having contacts with Texas family"? This is wild speculation based on rumor. And there was nothing "mysterious" about his death. He was killed by a Seal Team at the direction of the President. And the Golan Heights has nothing to do with what is occurring in the Middle East, except in the most peripheral way. After Syria made war on Israel, it was captured and annexed. I welcome you're taking the time to share your point of view, but try to get your facts straight. Margaret Thatcher's Funeral is Today - R.I.P. Gun Confiscation. Don't Say It Can't Happen Here. Am I a Dangerous Extremist? Are You? Is National Poetry Month an Oxymoron?